It’s normal for us at Mountain House Holidays to be guiding people up Mulhacen which at 3482m is the highest mountain in The Sierra Nevada and the whole of mainland Spain. However yesterday, having a day off we decided to climb Mulhacen ourselves for the sheer enjoyment of it. Legend has it that Mully Hasan the deposed and penultimate Arab King of Al Andalus is buried on the mountain. Most people tackling Mulhacen take the National Park bus from Capileira up to Alto del Chorrillo at 2700m and ascend and descend Mulhacen’s South Ridge. It’s fine to use the bus and the South Ridge as part of the excursion but to only do a “there and back from the bus” is a short day and will leave you thinking it’s not been a proper day out! Setting out early in summer is the best tactic. This allows you to get the climbing done before the heat of the day starts to sap your energy. We started from Hoya del Portillo 2160m at 7.30am. It was cold, 10 degrees C and for the first 20 minutes we were in the forest so no sun. Still the motto is: start cold and warm up walking up hill! By the time we had reached the view point of Puerto Molino 2380m (30 minutes) we were warm! Our route continued along the ridge of Prado Llano 2577m to 2622m before joining the old road along to Alto del Chorrillo arriving there for a breakfast break at 9.15am. The actual ascent of Mulhacen along the south ridge is pleasant, and in summer a well defined path with cairns marking the way through the screes just below the subsidiary summit of Mulhacen II at 3361m. Even though we stopped to take photo’s of plants and beetles, we reached the summit at 11.20am a total time of 3 hours and 50 minutes. A distance of 11.4Km with a total height gained of 1412m. An hour and 20 minutes ahead of Naismith (The rule for calculating the time to walk up mountains – allow 4Km per hour and add a minute for every 10m of ascent). We were ahead of the crowd from the bus so the summit was fairly quiet. There was a small group of “Cabra” the Iberian Ibex mooching around not particularly afraid of us, the usual Alpine Accentor and a large squadron of Swifts giving a good display of aerobatics. After a short break on the summit, it was time to head downwards before the crowds from the bus arrived. There is a zig zag path down the screes of Mulhacen’s West flank which we took heading to the Collado de la Mosca which gives great views of both Mulhacen’s and Alcazaba’s 3371m North Faces. A further 10 minutes and you are down to the Caldera Hut, an unmanned “bivouac” hut with bunks, tables and chairs. From here there is an impressive view back up to Mulhacen’s summit. A spot of lunch was called for at The Caldera! With clients if we had caught the bus we would continue down to the Poqueira Refuge 2500m to make a circuit back to Hoya del Portillo. However as we had not walked the old road back to Alto del Chorrillo for a few years we though we’d re-acquaint ourselves with this option. It proved as boring as we remembered it though a useful way out if the weather turns nasty. From Alto del Chorrillo we then returned the way we had ascended finally arriving back to Hoya del Portillo at 3.30pm. All that remained was to drive back to a bar in Capileira for the customary drink and plan for the next outing! Mountain House Holidays and our company “Sierra Nevada Guides” are the only British Qualified Guides (International Mountain Leaders) working in Spain’s Sierra Nevada and Alpujarra. The Sierra Nevada Guides website has a lot of useful information for people wanting to visit the area, especially for walkers and climbers. We are always happy to respond to emails answering questions about the area. Although summer has been a few weeks late in arriving this year, it has now arrived and is firmly established. Although our Mountain House is at 1300m above sea level, a few days ago I found it hard to sleep as the bedroom was airless and it was too hot to be comfortable inside at 21 degrees C. As a consequence I got up early and decided to check out the conditions on Veleta 3394m the second highest in Spain’s Sierra Nevada. Leaving home at 6am where it was 21 degrees I drove to Hoya de la Mora (2500m) where it was a cool 13 degrees and felt distinctly cooler with a brisk wind blowing. The ascent of Veleta is one of the easiest of all the mountains in the Sierra Nevada. A gentle ridge and fairly good path for all but the final 200m of ascent where there is a steep zig zag path up through scree and boulders. Reaching Posiciones del Veleta at 3100m a Griffon Vulture soared overhead reminding me that I always see them when on Veleta. By the time I got the camera out and switched on it was too far to make a decent picture. In total it took me two hours to reach the summit and although there was snow around, I didn’t have to cross any patches on my ascent. For most of the climb I was just about warm enough in shorts and a t shirt though my hands started to get cold near the summit. Once on the summit and no longer generating heat from the exertion of ascending I needed a windproof fleece hat and gloves. I guess it was around 5 degrees with the windchill. Cool! I choose to descend towards the Carrihuela refuge 3205m down by the old track that used to cross the Sierra Nevada from Granada to Capileira on the south side of the range. As usual for this time of year the track was buried in snow for about 1Km beyond the refuge. On the way to the refuge there were a number of alpine plants coming into flower as the snow had recently receded. And I managed to get a few photo’s before the battery in my camera gave up! Notable were the Sierra Nevada Violet (Viola crassiuscula) and “Blue Dreams” (Chaenorrhinum glareosum). It was at this point with the camera out of action that I noticed a group of six Grifon Vultures circling above me! At the Carrihuela refuge I met a cyclist who had wanted to take the old road and cross the snow with his bike heading for Capileira. The snow was still frozen hard and the slope to cross is very steep with a bad run off if you were to slip. Fortunately he had already decided against it though it would be a massive 120Km detour. He said he’d cycled the route a few years ago and I left him considering whether or not to wait until late afternoon when the snow might be safe enough for safe passage without crampons. The rest of the descent back to Hoya de la Mora was a pleasant stroll though I could feel it warming up! Soon the gloves came off, the fleece hat was replaced by a buff and eventually the windproof came off too. 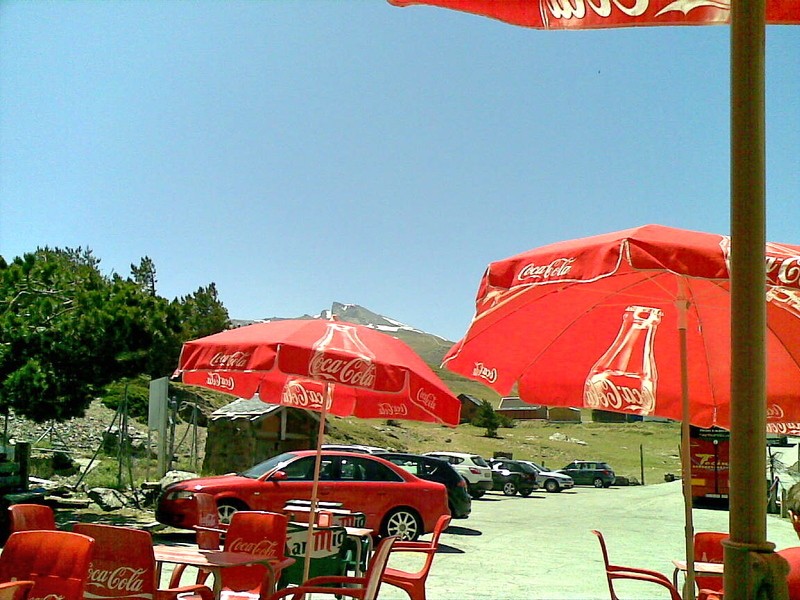 It was a pleasant 22 degrees back at the car and I headed to the “University Albergue” for a cool beer and tappa. 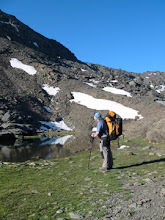 Mountain House Holidays run guided walking holidays in Spain's Sierra Nevada Mountains. Mike and Jane the owners of Mountain House Holidays are both qualified International Mountain Leaders. They also run Sierra Nevada Guides and undertake guided walks for individuals and groups. There is a lot of useful information for people wanting to visit the Sierra Nevada on the Sierra Nevada Guides website.